A MISTAKE IN INK CAN BE COVEERED! 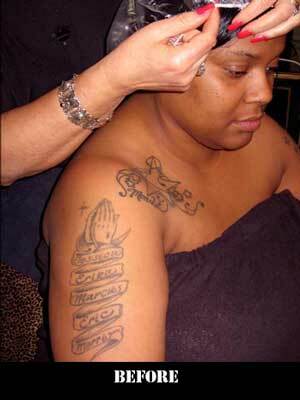 CONCEALING TATTOOS IS ON THE RISE FOR WEDDINGS AND SPECIAL EVENTS. 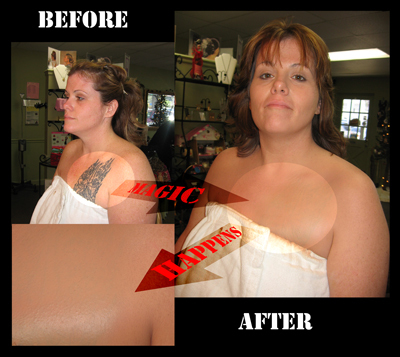 AIRBRUSH MAKEUP, A SPECIAL TECHNIQUE CAN DO THIS AT A REASONABLE PRICE AND IS PAIN FREE AS OPPOSED TO LASER REMOVAL. IT IS A TEMPORARY FIX FOR A SPECIAL EVENT. IT IS WATER PROOF, SWEAT PROOF, AND TRANSFER RESISTANT.